Buy New Nikon COOLPIX Digital S9500 Digital Camera (Black) Free 8GB, Case Malaysia At FotoZZoom! The COOLPIX S9500 Digital Camera from Nikon is a point-and-shoot with an 18.1MP CMOS image sensor that enables you to capture low-light shots without a flash. When the light is just too low, the pop-up TTL auto flash is there to provide extra illumination. The camera features a large 3" 614K-dot OLED touchscreen display. A member of Nikon's Ultra-Slim Zoom collection, the S9500 is equipped with a 22x NIKKOR ED VR zoom lens that has an effective focal length range of 4.5-99mm (35mm equivalent: 25-550mm), covering wide-angle to telephoto shots, and an aperture range of f/3.4-6.3. Lens-shift and Electronic Vibration Reduction (VR) help keep your images free of blur, even when your hands are unsteady. Thanks to built-in Wi-Fi, you can capture an image and instantly send it to your compatible iPhone or Android smartphone, iPad or Android tablet, or other Wi-Fi enabled device, such as your iPod touch. Once you install the Wireless Mobile Utility application on your smart device, you'll be good to go. Then, use your smart device to email, text, or upload your image to your favorite social networking or photo album sites. The built-in GPS, mapping, Electronic Compass and Points of Interest (POI) features let you create photo journals, recording the exact location of each shot you take--so you can follow the path of your adventure. Share your photo journeys on Google Earth, Google+ and other social media sites, or with the included Nikon View NX2 software. The mapping and Electronic Compass functions also help you navigate unfamiliar destinations, and Points of Interest (POI) show you nearby photo-ops, e.g., scenic lookouts and historic landmarks. 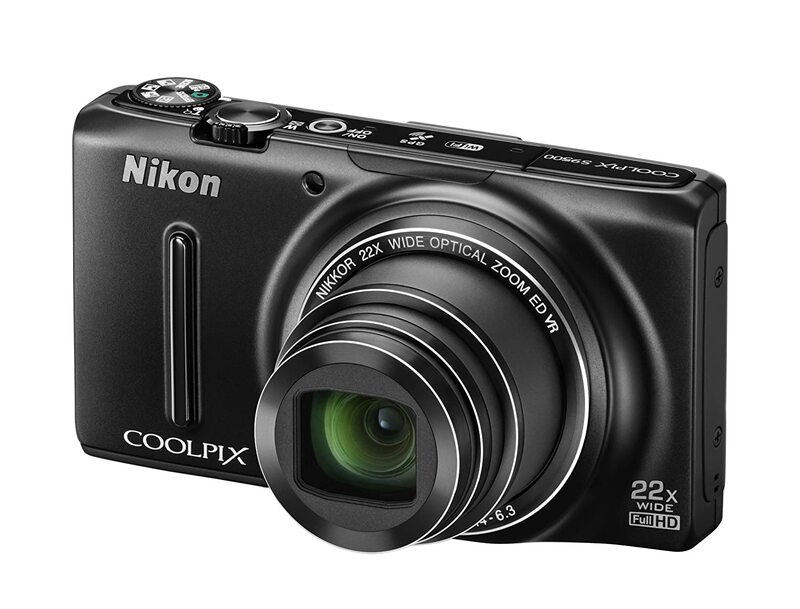 With the COOLPIX S9500, you can also record Full HD 1080p video and capture panoramic landscape and 3D shots. Capture an image and immediately send it to your compatible iPhone or Android smartphone, iPad or Android tablet, or other Wi-Fi enabled device, such as your iPod touch. Install the Wireless Mobile Utility application on your smart device and you'll be good to go. Then, use your smart device to email, text, or upload the captured image to social networking or photo album sites. Record Full HD 1080p video at 30fps with stereo sound. Then, watch them on your HDTV via the camera's HDMI output, which provides a choice of viewing resolution: Auto, 480p, 720p or 1080i.